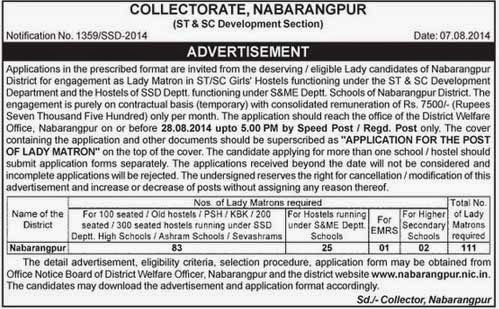 Application in the prescribed format are invited from the deserving/eligible lady candidates of Nabarangpur (Nowrangpur ) District for engagement as Lady Matron. Total of 111 Lady Matron Post are Vaccant in Nabarangpur. The Application Should Reach latest by 28.08.2014 by Speed Post or Registered Post Only. More Details below. The Job is Purley Contractual Basis and the Montly Salary / consolidated Remuneration is of Rs 7,500 only.